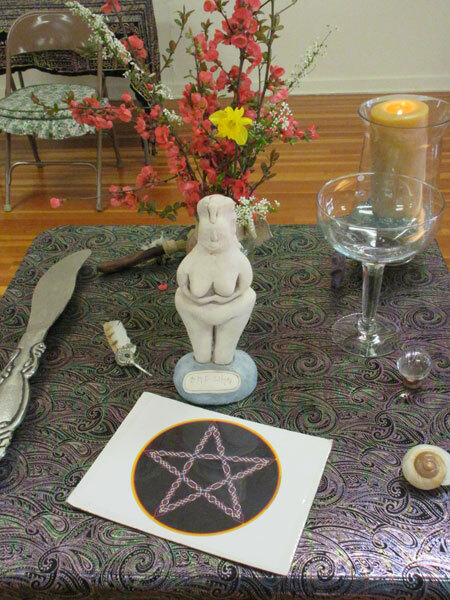 Our Cross-Quarter rituals are womyn only: Imbolc, Beltane, Lammas, Samhain. Our Quarter rituals are open to all genders and families. We welcome children with appropriate parental supervision. 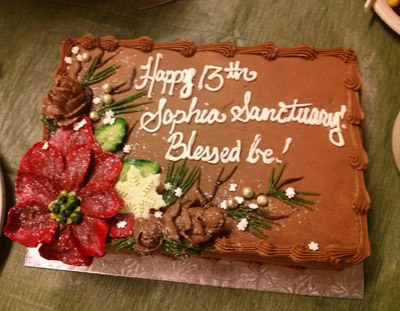 Sophia Sanctuary is a 501 c(3) non-profit and we happily accept donations at our events. Donations are used to help rent the spaces, buy ritual materials, etc. For more information about our Cross-Quarter rituals you need to be a member of our site. To gain membership please fill out the form on our Contact page and be sure to choose the Membership Request category. Matrix Meetings: These meetings are always the second Monday of the month, and will be at the location described in our forum. Interested Sophia Sanctuary members are welcome to attend. The Matrix is our "Board of Directors" and includes such roles as Dreamer (President), Magician (Treasurer), and Griot/Scribe (Secretary). Any womyn and Sophia Sanctuary member can apply to be on the Matrix, provided she has attended a few of our events and planning meetings, to familiarize herself with our group and our concensus process. Full Moon Circle: These rituals are always on the evening of the full moon, and are at the location described on our forum. The circle is generally closed to new members, except in February and March, when the circle opens to new and returning members. If you are interested in joining, you must attend either the February or March circle. Ritual Planning Committee: These meetings are always on the fourth Monday of the month at the location described on our forum. Interested womyn who have attended at least one of our rituals may participate in planning our rituals. Womyn's Saunas: These womyn-only saunas are on the new (dark) moons, at Ruby's house, and open to all womyn. It is not necessary to bring a suit but you are encouraged to bring your own towel. If you have an extra piece of wood you can donate to the fire, that is welcomed. More info on the forum. Womyn's Salons: These occasional womyn-only meetings are for enriching our lives with crafts, divination, songs, and other relaxed pursuits. Salons are generally scheduled for the first Wednesday of the month. Stay tuned to the forum for more information about these events. And if you'd like to hostess one, let us know! A note about our Temple space: We do not have an actual space, so we meet either outdoors at local parks, in each others' homes, or in a rental building for meetings, rituals, etc. IMBOLC: This event is celebrated on or around the new moon in Aquarius each year, near February 2nd. Imbolc is the first of the spring festivals for fertility. Imbolc is the celebration of things yet to be born for the New Year- those things that are hidden under winter's last snows. It is a time for preparation, dedication, and renewal. We celebrate the Goddess Brigid in her many aspects. OSTARA (Spring Equinox): This event is celebrated on or around March 19-22 each year. Ostara occurs in the middle of March when the length of day is equal to the length of night. It is a time of balance, the official end of winter and beginning of spring. The second of the fertility festivals, Ostara symbols are eggs, the seeding and preparation for the remainder of the year. BELTANE: This ritual is celebrated on the full moon in Scorpio each year. Beltane has long been celebrated with feasts and rituals. Beltane marks the return of vitality, of passion. Beltane is the third of the spring holidays that ring in the festivals for fertility. Not just fertility of self and body, but fertility of the earth for an abundant crop, and garden, a fertile mind for imagining new ideas and concepts; perhaps for work or home. Celebrations usually culminate with a maypole dance. MIDSUMMER (Summer Solstice): This event will be on or near June 19-22 each year, and is most likely outdoors. With the warmth of the season caressing the land, the celebration of the Summer Solstice brings forth a truly joyous recognition that we will soon enjoy the fruits of our labors in the next few months. Falling on or about June 19-22, the Summer Solstice is a time of light and of fire. It is a time to reflect upon the growth of the season: the seeds that were planted in the earth and the seeds planted in our souls. It is a time of cleansing and renewal. It is a time of love and growth as well. LAMMAS: This ritual will be on or near full moon in Aquarius each year. Lammas occurs in late July or early August. It is the first of three harvest festivals. It is usually associated with the Goddess manifest as Demeter, Ceres, Corn Mother, and other agricultural Goddesses. Colors are golden yellow, orange and green. It is a festival of plenty and prosperity, community sharing and feasting. MABON (Autumn Equinox): This event will be on or near September 19-22 each year. Mabon marks the Second Harvest, the end of the grain harvest (which began at Lammas). The Equinox mirrors dwindling of life (and eventual progression to rebirth), as well as the struggle for balance. We celebrate the abundant earth mother. Day and night are equal lengths. SAMHAIN/ HALLOWMAS: This ritual will be on or near the new moon in Scorpio each year. Samhain (Sow-ehn), when our beloved dead walk the Earth, is the time between times. There are cracks between the worlds, and the veil between worlds is now the thinnest. Ancestors desire to be with us. This is the Celtic New Year, time for shamanic journeying and initiations within the mountain caves, barrows and mounds where Ancestral spirits whisper to us in our waking dreams. We honor those who have passed on. YULE (Winter Solstice): This event will be celebrated on or near December 19-22 each year. This Sabbat represents the rebirth of light. Here, on the longest night of the year, the Goddess gives birth to the Sun God and hope for new light is reborn. Yule is a time of awakening to new goals and leaving old regrets behind. Food and treats were hung on branches for the spirits to eat, and a five-pointed star, the pentagram, symbol of the five elements, was placed atop the tree. The colors of the season are red and green, reflected in the holly and evergreen boughs, symbols of the promise of life's return. Your contribution helps fund our rituals, events and celebrations! Please give generously so we may continue our mission of Healing, Education, Ritual, and Service in the community. Thank you! Click the button to go to Paypal and enter in your contribution amount.